Recently, I decided it was time to use up as much of my 'scraps' of card stock as I can. You can get two card bases from one sheet of 8-1/2" x 11" paper. So, I have all of these 4-1/4" x 5-1/2" card bases that really need to be used to make room for more. Is there method to my madness? I'll have to let you know if, or when, I get all of it used up. Today's card is one of my 'scrap' cards. 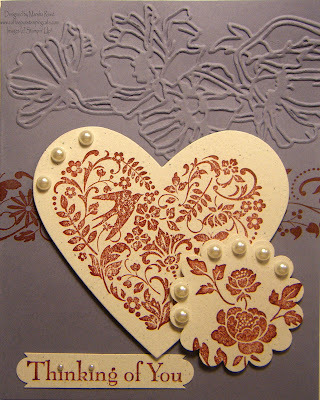 I combined Wisteria Wonder, Cherry Cobbler and the You Are Loved stamp set and I really like the two together. I have a friend who loves purple and it will be a perfect way to let her know I am thinking of her. Now it's time to get my chores done. I have a couple of ideas percolating in my head and I want to give them a try this afternoon while my little man is napping. Aiden loves to sit on my lap and 'help' me make cards. He is talking at me all the time while sitting on my lap. Of course, I can't always understand his two year old version of speech but he keeps right on talking nonetheless. We do have some interesting conversations.